Although the project of writing a topic-focused blog/book is temporarily on the back burner, I’ve been thinking about what I want to learn about learning so that I can squeeze it into little bits of time here and there. This way, I can keep an eye out for learning opportunities, questions, and books that would be worth exploring. Map a good path/course for learning (guide questions, sequence, …): It usually makes sense to learn things in a particular order. This is part of the value offered by teachers and coaches. A good curriculum organizes ideas so that they build on previous ones, and individualized learning plans can focus on the most useful things to learn first. Like the way a curriculum includes recommended reading, a good map also includes the resources that can help people learn the specific topics. Success: I can organize learning maps for things I know (ex: how to learn Emacs or Org). I can plan learning maps for the things I want to learn, with feedback from more experienced people who can help me make sure the sequence makes sense and that I’m using the best resources. How: I can learn this through practice, especially if I can compare the maps I make with other people’s versions. I can learn this through feedback from coaches. Explore: What are some ways you can “tinker” with a new topic? How can you recognize when you’re trying to climb a cliff that’s too steep and find alternative routes, versus dealing with something that will yield to persistence? Find and use the appropriate resources: There are different kinds of resources, and resources can be of varying quality or appropriateness. Effectiveness is learner-dependent, too. For example, I do well with books, but I have a harder time with video or audio, and I have a lot to learn about working with people. Using the right resources can accelerate learning, while using poor resources can set me back. Success: I can quickly identify key resources based on other people’s experiences and recommendations, adjusting the list depending on availability and my preferences. How: I can work on getting better at preliminary research. I can estimate how useful a resource will be and what I aim to get out of it, and then compare that with the results. I can work on getting more effective at learning through different channels through practising, reflecting, identifying weaknesses, and building on strengths. Explore: How can I learn from a coach? How can I get better at learning from free courses? How can I make the most of what I can learn from books? Take more effective notes: Notes are a great way to condense and personalize knowledge as well as integrate what I’ve learned with other things I’ve learned before. Success: I keep different levels of notes: details, summaries, and maps that integrate ideas with other topics. I can review my notes easily, refreshing my memory and following up on questions or ideas. I might not remember everything, but I can usually find things again, and I can see where the gaps are. How: The Cornell method looks interesting, so I might try that for detailed notes. I also want to get better at organizing and reviewing my electronic notes, and at mapping the connections between ideas. Explore: How can I manage different levels of notes well, so that I can dive deep or get the overview as needed? Integrate new knowledge with old: It’s one thing to learn, and it’s another thing to integrate what you learn into what you know so that you can see where the gaps, conflicts, or synchronicities are. Success: I note follow-up questions and ideas after learning something. I fill those in with further study and cross-references. I have a syntopical index like the one mentioned in How to Read a Book. Explore: How can I map what I know and what I want to learn, and then connect that with the building blocks? Improve working memory and concentration: This is useful when learning complex topics like programming because I have to hold different chunks of information in my head. Also good for popping the stack in terms of tasks, conversations, and so forth. Explore: How can I get better at remembering sequences and dealing with distractions? Success: I’ve memorized key information such as phone numbers, basic recipes, and important skills. Explore: What’s important to store in my own memory? How can I get better at doing that? Recognize learning opportunities: Squeezing more learning out of every moment! Even in routines, there’s always room to learn more. Success: I can recognize and take advantage of learning opportunities, getting over the barriers of boredom (for routine tasks) or emotion (for difficult moments). Explore: How can I improve my routines? What can I do to handle difficult times even better? Where do I run into diminishing returns or over-optimization, and where should I move on? Translate learning into changes: Book knowledge isn’t everything. I’ve got to do something with it too. That way, I don’t just take a book’s word for it. Instead, I can find out whether something really works for me, and I can annotate it with my experiences. Success: I’ve slowed down my learning pace so that I test and integrate more of the knowledge that I pick up. I define clear objectives and commitments before learning something so that I know the time will be worth it. How: Practice, reflection, scheduled decision/learning reviews. Explore: What small actions can I take to integrate what I learn into how I live? How can I keep track of what I’m learning and what the results are? Observe and reflect: Life has a lot to teach me if I remember to look. Noticing what’s unusual–or what’s absent, which is harder–can lead to lots of learning. Success: W- is a great role model: he’s more observant than I am, and he follows his curiosity in learning about lots and lots of things. How: Practice and feedback. Spot-the-difference games in real life? Asking more questions, too. Coaching, perhaps? Explore: How can I look at my life with an outsider’s eyes? 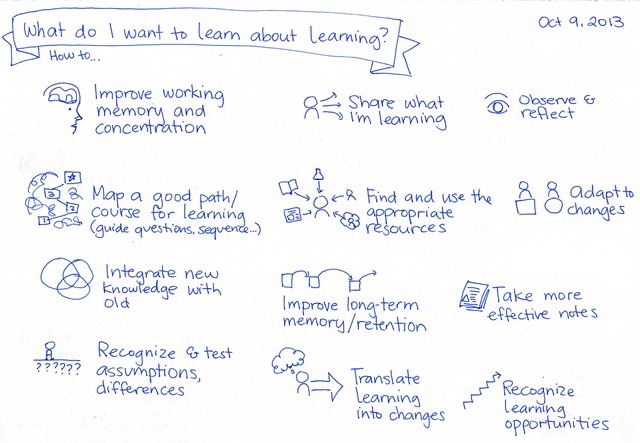 How can I become more attentive and observant using visual thinking or other skills? Recognize and test assumptions, differences: When I make decisions or learn about things, it helps to see what I’m taking for granted. Success: I can articulate my assumptions and devise simple tests. When learning something, I can use critical thinking to think about what assumptions are embedded in the learning and identify situations where the lesson may not be valid. How: Practise by analyzing and testing my decisions, and then reviewing the results. Read critically. Explore: Can I find or come up with a framework that will help me identify more of my assumptions? How can I do small tests? Adapt to changes: This is related to recognizing assumptions and differences. Real life can sometimes change too slowly for me to notice when my assumptions are no longer valid. Learning includes getting a sense for when things may have changed so much that I need to reconsider things. Success: I have “tripwires” that trigger re-evaluation and additional learning. I periodically practise zero-based thinking. Explore: What scenarios should I watch out for, and what early warning signs can trigger re-evaluation? How do I make sure I don’t miss those signs? Share what I’m learning: I learn a lot in the process of sharing what I’m learning, and I can help other people learn as well. Success: I have a smooth process for sharing what I’ve learned and what I’m learning. I incorporate people’s feedback and ideas into my learning process. How: Blogging, drawing, putting together presentations, etc. Explore: How can I make sharing more efficient or more effective? This will be fun. If there’s anything you’d particularly like to learn more about, or if you can help me learn some of these things more effectively, please feel free to comment! If you want to follow my journey so far, check out my learning-related notes on Flickr and on my blog. Enjoy!